The Hurrieder I go, the Behinder I get! Hopefully the title of this blog, tells you what it has been like here the last few weeks, LOL. The Kickstarter Project funded, YAY! Several pieces have been in shows, and I am working on getting the rewards together for Kickstarter, framing pieces for shows, ordering cards and Giclees, and the normal business of taking care of parrots and cats. 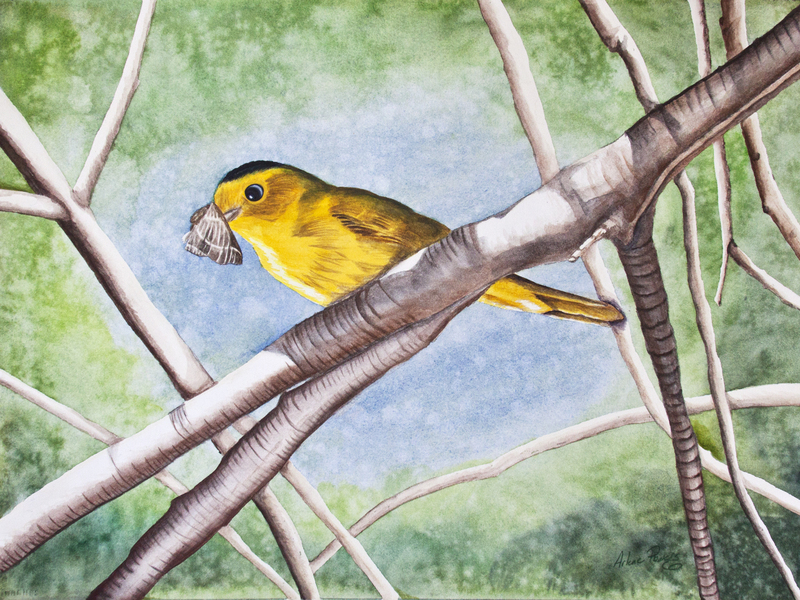 OK, so the parrot – cat thing is a full time job since cats have staff and parrots have slaves…….but I have managed to get a little painting in too, and the Wilson’s Warbler is now done! Fixed a few branches, darkened the moth and fixed the tones of the reflected light on the ventral side of the bird. The raffle for ” Mingus” is still going on so don’t forget to check out http://the-oasis.org for your tickets….the raffle goes until Nov 3. One of the local clubs, AABA, raffled off “Too Much” at the Sally Blanchard talk on Saturday as a fundraiser, and it has a wonderful new home with Patrick and Linda Cravens. Don’t forget to put the Audubon “Gifts From Nature” show on your calendar for the weekend of Nov 22-24! The weather here in AZ has finally cooled off and we are enjoying a beautiful fall season. Ok, so the leaves don’t turn much here, but it is glorious outside, all the doors and windows are open, and I hear all the birds outside noisily going about their business. Speaking of birds, it is way too quiet in the bird/family room………hmmmmm better go see what they are chewing up now! Hope I still have a room left! Argh – not the door sill – we need to use that door…..um Loki, why is all of your fresh food now on the blinds? Ok, guess I didn’t need those blinds…..you want a nut…… wait you just had one….you want a grape…….the grapes are all over the blinds…….OK…..just a second……later! As much as I love going on vacation, I love coming home! It is great to get out, hike, kayak, and photograph birds, but even better to come home to my flock! They are so welcoming, even though it is a little noisy…..OK a LOT noisy….but hey, it is a happy noise. Then everyone has to be petted and reassured that we are going to stay home for a while. Then they have to have their treats and some extra scratching…….even the cats are happy we are home. The cat hair and feathers have risen to a new level, as we shovel our way through to get the laundry done and get everything back in order. Our grown up kids have done a great job of feeding and caring everyone, but the birds and cats have assured us that they are starving for treats and affection. Hubby is worn out from travel and has fallen asleep, surrounded by kitties. Yawn, think I will be joining them soon. 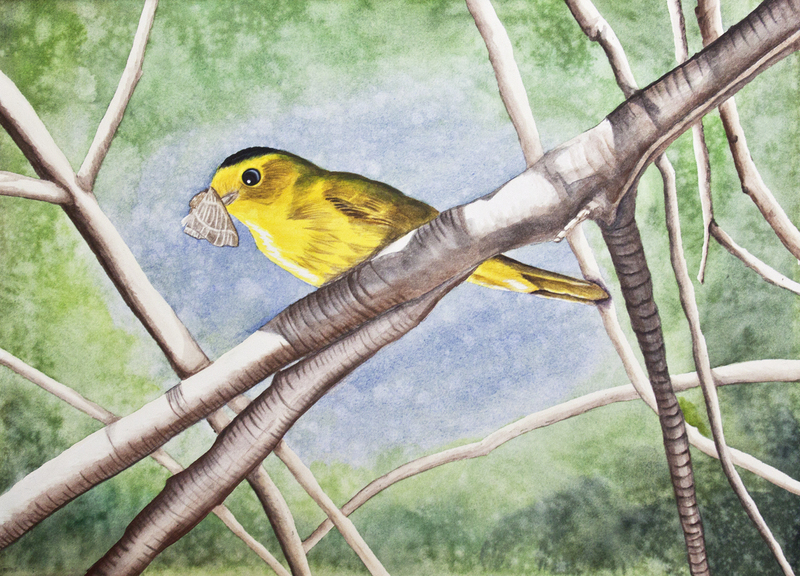 The Wilson’s Warbler is almost done! The Kickstarter Project has closed and was fully funded, so I will be getting prints, cards and framing done over the next few weeks. Once again, a great big “Thank You” goes out to all of my project backers!